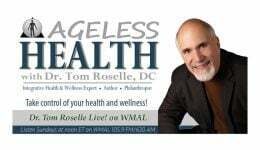 Podcast Archive - Page 3 of 36 - Dr. Tom Roselle Live! Neurocognitive Dysfunction Listen to Dr. Tom Roselle, DC and Dr. Leonard Poe, DC discuss Neurocognitive Dysfunction. Neurocognitive Dysfunction is a reduction or impairment of cognitive function in the brain, but particularly when physical changes can be seen to have occurred in the brain, such as after neurological illness, mental illness, drug use, or brain injury. Natural Approaches to Eliminating Knee & Hip Pain Listen to Dr. Tom Roselle, DC and Dr. Harlan Browning, DC discuss in depth knee and hip pain and natural approaches to eliminating knee and hip pain. Vitamin D Deficiency Listen to Dr. Tom Roselle, DC discuss Vitamin D and how a Vitamin D deficiency could be driving diseases such as chronic obstructive respiratory disease (COPD).